Ah, Laos, the last country of the SE Asia foursome to visit. Our 2 week journey through Laos is behind us but I'm starting to think it could be my favorite in the foursome. But is it? I don't really know. Dilemmas! I am still in love with Vietnam for its food, and unfortunately, food in Laos was....acceptable. However, I'm willing to overlook the food because the rest of the country is too damn beautiful. Laos people are also friendly and non-confrontational, in other words, they don't harass tourists, which is a win! The best local dish we ate, and ate, and ate was khao soi. Khao soi is made with thick rice noodles. Into the broth goes a big spoonful of thick sauce that is mainly tomatos, fermented soy beans and ground pork. The soup is served with a side of herbs, veggies, chilis and limes. I love trying different versions of noodle soup and noticing their similarities. This is like a version of a Vietnamese pho or a Chinese zha jiang mian. Below is the khao soi from a stand right next to our guesthouse in Luang Prabang, which we visited way too many times in a span of 4 days. Laap is another traditional Laos dish which can be made with a variety of meats. I'm just guessing pork is the most common, but for all I know maybe it's goat brain. Anyways, we tried the pork. The meat is ground, stir fried and served like a warm salad with a lot of herbs and fish sauce. Not amazing, but not bad either. I really loved the sticky rice that's served all over Laos, sometimes steamed inside bamboo sticks, and sometimes in giant bamboo containers. To clarify, this is a portion size for one person. One of the best meals from Vientiane was at Kung's Cafe. The cafe is at the end of a small alley and feels like a home garden. The dishes are both traditional and reasonably priced. 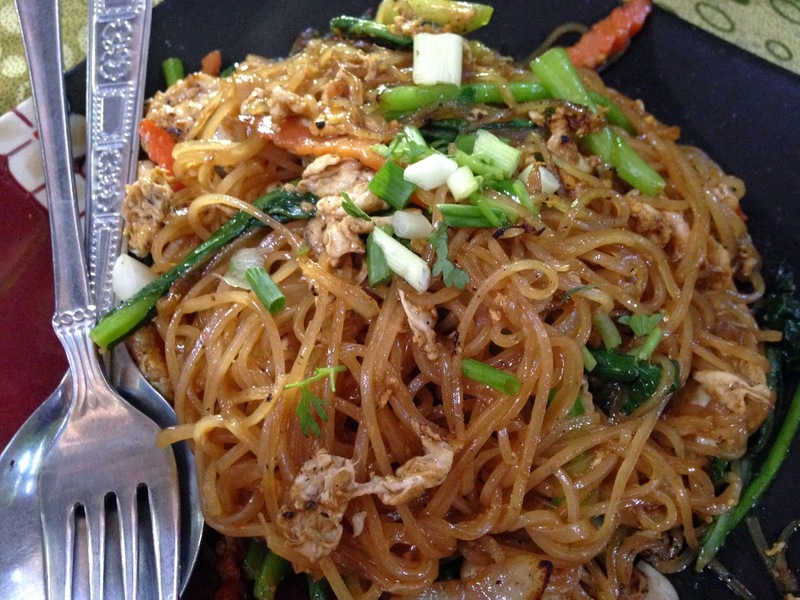 We tried the pad lao which was made with clear noodles, eggs and scallions. It was not as heavy on the fish sauce as pad thai, but still really good. Next was a delicious red fish curry with rice. My favorite was the sticky rice pancake stuffed with a mango, which can be drizzled with maple syrup. Lunch dessert? The sweet sticky rice pancake stuffed with mango. Food in Luang Prabang was pretty good but also a little westernized due to the town being such a tourist hotspot. There is a local night market that serves up some tasty bbq, we had the pork belly and a whole fish. For budget travelers, this market also has several "eat as much as can fit on a plate" deal for 15k kip ($2). One tasty meal in Luang Prabang was at a restaurant on the main road called Cafe Ban Vat Sene. There is a big western menu but in the back are some regional Laos dishes from different ethnic groups, which are all labeled. We tried the tai dam pork and fermented bean dip served with steamed vegetables. Sounds weird and gross? It's the opposite. Unfortunately the word "fermented" has a terrible reputation, let's just replace it with something like "cured" or "aged", like a matured cheese. Suddenly it's fancy. We also tried a Hmong style pork belly and greens stew that was milder but tasty. Laos is definitely for nature lovers and one of the highlights of our trip was a long hike we did outside Vang Vieng called the Secret Eden trail. Thankfully we did this with a tour company because it was a very rugged trek/climb through the mountains for five hours. This was rated "easy" for some reason, and... maybe I am just in terrible shape, but it was definitely NOT. However, the views were beautiful and in the middle the guides stopped and cooked up lunch by a waterfall. My personal highlight of Laos was immersing myself in a 3 night yoga retreat in Nong Khiaw, just north of Luang Prabang. This was my first ever yoga retreat and I think I may now be hooked. Nong Khiaw is a beautiful laid back village set against limestone mountains and the Nam Ou River. The retreat was hosted by Luang Prabang Yoga and took place at a beautiful little resort called Mandala Ou. The yoga program was wonderfully structured and personalized. And since this is a food blog...yep the organic buffet meals were delicious too. They created a different menu each night (middle eastern, thai and indian) so we never got the same stuff. This was the perfect spot to lay a mat. Luang Prabang is probably the main destination for most travelers in Laos and it's easy to understand why. The town is very well preserved with golden temples and French architecture. Parts of it have become upscale as posh boutiques and hip cafes open up. Sunsets along the Mekong River are gorgeous too. For the most part, I loved Luang Prabang. However the only thing that annoyed me to pieces was the morning alms ceremony, which was conveniently across the street from where we were staying. The alms ceremony could have been a beautiful site to see, but all I saw were disrespectful tour groups flashing cameras in monks' faces and taking selfies with them. Street vendors exacerbated the situation by profiting off the tourists, allowing them to participate in the ceremony and providing poor quality food. We even saw monks throw out food from tourists just one block later. Maybe I'm being slightly hypocritical in complaining about this, after all, I am a tourist too, I want to see these places too and I want to document them. But I do believe, or hope, that there is such a thing as respectful tourism and that it can be practiced more. We ended Laos in a northern town called Oudomxay, which was really just a transit town with a cheap local market where we stocked up on some warmer gear. From the bus station we bought tickets to Jing Hong in China, which is in Xi Shuang Ban Na region. Of course the bus ended up going somewhere else that was about 2 hours away from Jing Hong, because there weren't enough people, but we were able to transfer pretty easily. Next up, 6 weeks in China for the (the best) food, sites and family!